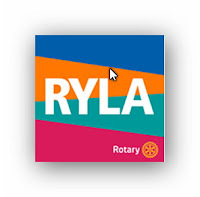 Rotary District 9600’s Rotary Youth Leadership Award (RYLA) Seminar will be an unforgettable experience in life, learning and laughter in a rural setting. The program’s aim is to give young people personal, leadership and citizenship skills to succeed in all areas of their life. RYLA will give young adults (18 – 26yrs) the opportunity to learn from other like-minded people and make new friends while being challenged both physically and mentally on their road to self-discovery. This experiential learning opportunity will enable individuals to discover their uniqueness and how to communicate and work with others. These young people will understand how to embrace change. RYLA participants will be from a variety of areas such as: the business community; the self employed; Livewire applicants; educational institutions; government agencies; community associations; Rotaractors; and service organisations. Local businesses, please consider sponsoring several young people aged between 18-26 to the RYLA Seminar. You will be providing a great opportunity for young people to grow and develop within their own personal lives, to develop their leadership skills within their career, and to understand the value of good citizenship. As a young adult, are you ready for a one-week transformational leadership program with other young leaders who want to make a difference in the world? Apply now for RYLA 2017! See you at RYLA 2017!